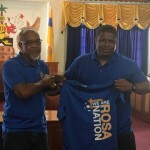 FC Santa Rosa took advantage of a stumble by early leaders, Queen’s Park Cricket Club, this afternoon, as the “Big Cannons” moved to the top of the Trinidad and Tobago Super League (TTSL) with a 2-0 win aways to Prisons FC at the YTC ground in Arouca. 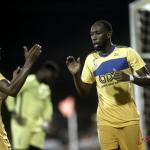 Silky midfielder Ryan “Fry” Stewart put Rosa ahead from the penalty spot in the 40th minute while teammate Kheelon Mitchell—another former Super League winner with Guaya United—added the insurance item in the 61st minute. Photo: FC Santa Rosa captain Ryan “Fry” Stewart (foreground) tries to hold off a UTT player during TTSL action at O’Meara on 28 July 2018. Rosa’s lead stands on the thinnest of margins, though, as the TTSL’s top three clubs all share 21 points and are separated by goal difference. 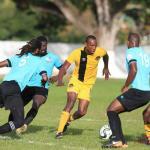 Rosa have a goal differential of plus 16 while Cunupia FC and QPCC have plus 13 and plus 10 respectively. 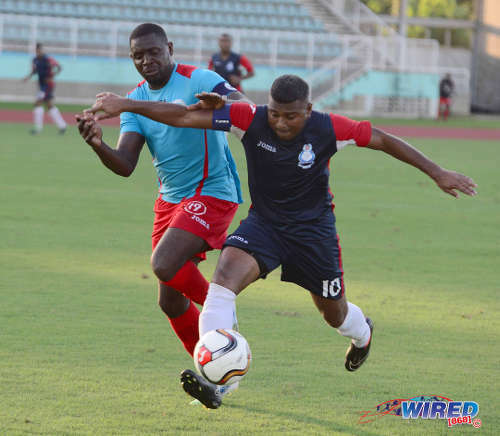 Cunupia also picked up three points today with a 2-0 win over the University of Trinidad and Tobago (UTT) at the Larry Gomes Stadium while QPCC lost 2-1 to fourth place Guaya United (19 points) yesterday in Guayaguayare. 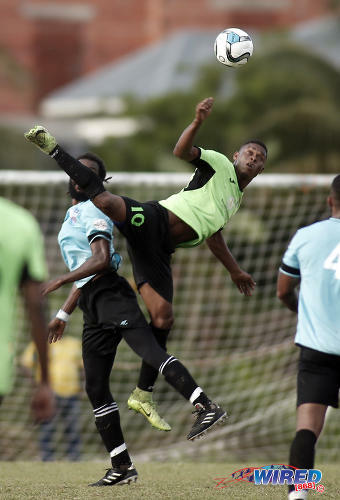 In other TTSL action, fifth place Matura ReUnited (17 points) lost ground to the leaders as they were edged 4-3 in Tobago by Bethel United—the result saw Bethel move from second to bottom to 10th in the 14-team standings. 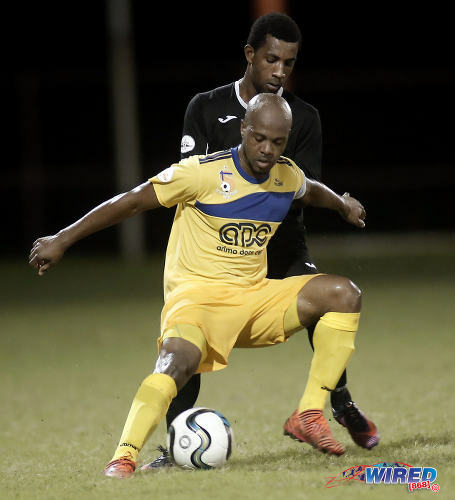 While sixth place Police (16 points) kept themselves in the hunt with a 3-0 win over Club Sando FC, which featured a ninth goal this season for Jason Boodram—just one shy of leading marksman and Cunupia forward Kevon Woodley’s tally. RSSR FC were triumphant in today’s final fixture as they overturned a one goal deficit to edge Metal X Erin FC 2-1 at the Erin Recreation Ground. 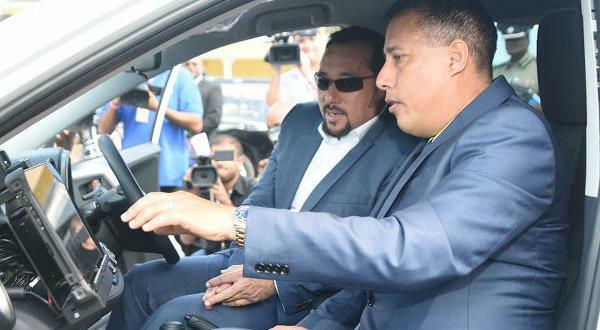 Erin are 12th with six points from nine games—just one point clear of table proppers, San Fernando Giants FC—while RSSR leapfrogged UTT to seventh place with 13 points. Photo: Police FC’s Jason Boodram (right) holds off Marabella Family Crisis Centre’s Ghmyo Harper during a 2015/16 CNG NSL Premiership Division contest. 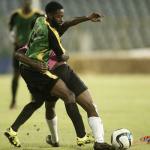 Metal X Erin FC 1 (Akiel Pope 47), RSSR FC 2 (Hakim Gulston 50, Corey Isaac 76) at Erin Recreation Grd. 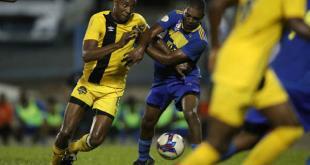 Photo: Guaya United forward Carlon Hughes (centre) tries to challenge an aerial ball while QPCC defender Yohance Marshall (left) stays close during TTSL action in Guayaguayare on 5 August 2018. 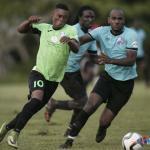 Petit Valley/Diego Martin Utd vs Cunupia FC, 4pm, St Anthony’s College.